Lisa Lorrel is a consumate performer who has starred in theatre and musicals in London's West End and throughout the UK. She won England's "Stairway To The Stars" and she was selected to perform at the Sydney Cabaret Convention where she placed in the top three for two years running. Lisa appeals to a wide range of musical tastes from Opera to current pop songs whith emphasis on songs that are well known. We welcome back the wonderful Katie Trigg. 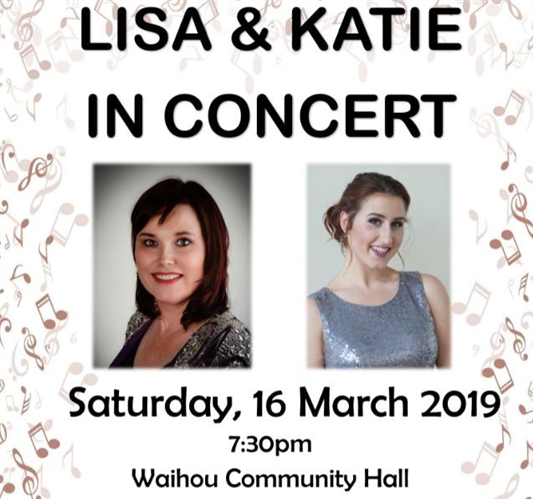 Katie will join Lisa singing both solos and duets from opera and show classics. Katie is remembered as the stand-out performer at the Stretton fashion shows between 2009 and 2012 and she was the stand-out soloist at subsequent choral concerts through to 2017. In 2018 Katie won the Waikato University School of Music aria competition and she was selected as one of eighteen voices from throughout NZ to take part in the NZ Opera School in January of this year.